I don’t think I made any resolutions at the start of this year, though I was hoping to take things a little easier. I was also suffering from toothache, which isn’t something that makes for clear thinking. Toothache almost always seems to strike when there is little chance of seeing a dentist for some days – perhaps because holidays put more stress on teeth, and I went back to work on the same day as my dentist, after an early morning appointment had done something to ease my pain and started me on a course of antibiotics. Going out to take pictures at least took my mind off of my teeth, and reminded me that worse things go on in the world. Not least in Turkey, where the Kurdish population was increasingly coming under attack by Turkish military, and across the border in Syria, where Turkey was aiding Da’esh (aka ISIS/ISIL/IS) to attack Kurds there. 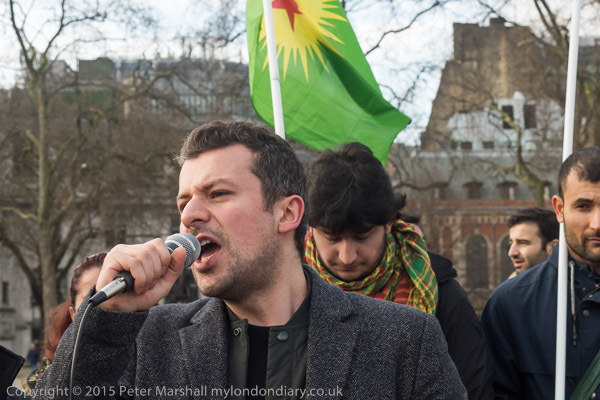 In my introduction to Kurds protest Turkish army killings I’ve tried to provide some basics about the very murky situation involving ISIS oil, Turkey, the PKK (Kurdistan Workers Party), Russia, Israel, the CIA etc., though of course nearly every account in the press or on the web is an attempt to mislead rather than clarify. 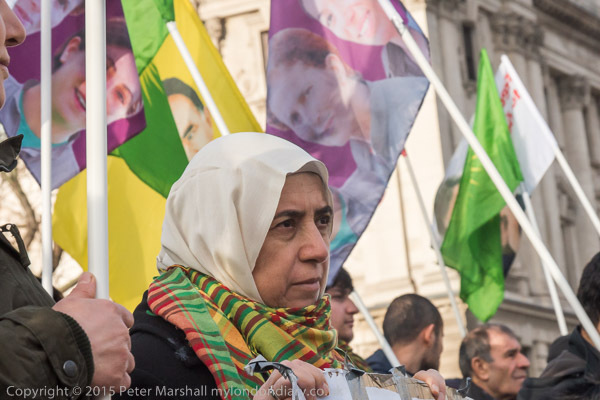 We’ve seen recently more of what President Erdogan is capable of, and his clampdown on the opposition and press freedom in Turkey, but this is a long-running issue, with the Kurds suffering long before he founded the AKP and brought it to power in 2002. 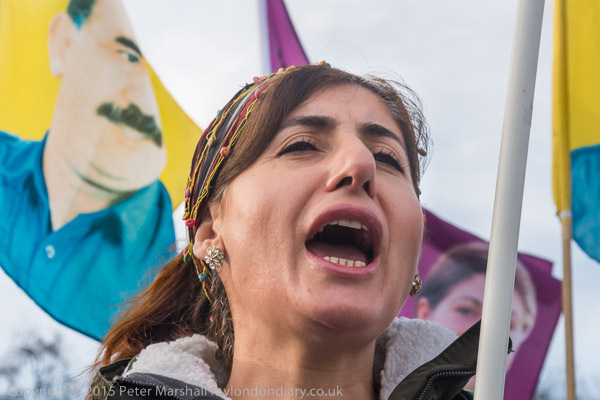 I first remember photographing them in London in 1999, after the Turks with CIA help captured and imprisoned the Kurdish leader Abdullah Ocalan. 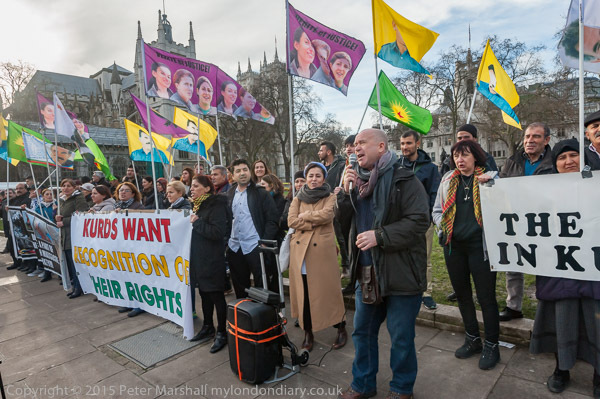 I’d come to Westminster to photograph another protest when I came across the Kurds in Parliament Square. Because I was on my way elsewhere I didn’t go with them from the square to the Conservative Party headquarters where they went to deliver their letter. 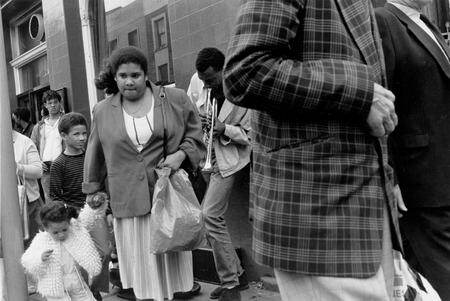 There they walked into the foyer and occupied it and the steps outside for several hours, which put their protest into the newspapers and TV. 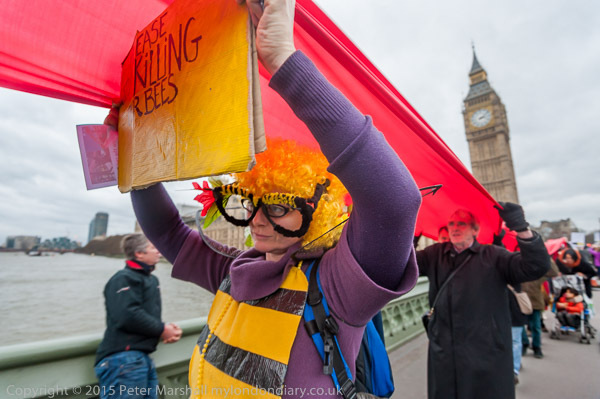 Peaceful protests that don’t involve such direct action are seldom treated as news by mainstream media, even when they involve thousands or tens of thousands of campaigners. Ocalan is still in prison in Turkey, and is still regarded by many Kurds both inside and outside Turkey as their great nationalist leader. It looked for a while as if there might be peace made between Turkey and the Kurds, and in June last year a pro-Kurdish party gained a considerable presence in the Turkish parliament, pursuing their aims by democratic means. But later in the year Erdogan called another election, in which many of these seats were lost, and military attacks against the Kurds increased. 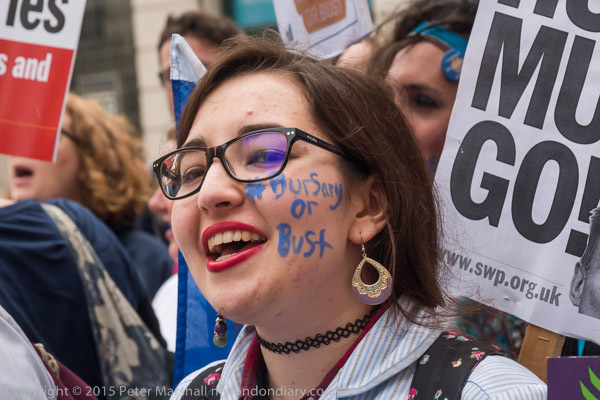 Teeth sometimes seem to feature rather prominently in my pictures which often show people shouting, and there were some good sets on display at this protest. Things can look even worse on occasions when I use fill-flash, which tends to light up the inside of people’s mouths in a sometimes alarming way – and often calls for a little local burning in with Lightroom’s adjustment tool. My parents were still of the generation where those who could afford it had all their own teeth removed, and a ‘full set’ of false teeth, often as a 21st birthday present or a wedding gift to each other. On each side of the marriage bed in many working class households you would find a ‘toothmug’ or ‘toothglass’ in which these lay overnight, often soaking in a mild antiseptic cleaning solution. Things had moved on a little by the time I had teeth and we had a National Health Service, though dentists managed to keep out of the free provision, retaining charges. There was however a ‘School Dental Service’, which was free, but at least at my local clinic, extremely off-putting and rather basic, and which only operated up to school-leaving age. They filled some, pulled others, told you not to eat sweets and that was it. When my own children came, they went to an NHS dentist and we were fortunate to have an excellent one, who looked after them and sent them on when necessary to an NHS orthodontist, something unheard of in my youth. And of course there have been advances in dentistry that have helped us all, and made time spent at the dentists generally almost pain-free. Though as I was to find later in the month and those following, after an extraction it can be a long and painful healing process. And of course there are still so many treatments not available on the NHS, and even NHS treatment is now priced beyond the means of many, with even the simplest filling coming as a Band 2 treatment at over £50 – though some still qualify for free treatment. Others find ways of self-treatment with superglue from the Pound shop and pulling teeth the old ways – which don’t bear thinking about. When I was young there were still many reminders of the First World War, though probably most still called it the Great War, or the Kaiser’s War, which we have now in the middle of celebrating the 100th anniversary. My father joined up towards the end of it when he was 18, having been working in munitions previously, and went to France, but fortunately only came under fire on one occasion. He was in the Royal Flying Corps (though I don’t think he ever actually became airborne) which became the RAF, and the planes were generally flown from fields a little back from the front line, but at one time when the Germans were retreating they advanced too far, and a shell landed nearby while they were sitting at a table outside having breakfast. He kept hold of his plate and finished his porridge, though there were a few more shells close by him later in the day, and some vehicles were damaged. He was fortunate, and seems to have enjoyed the life, particularly when he was largely left on his own to look after the stores when they moved to occupy Germany and many of the older airmen went home, while he was kept on until 1920. Late in his life he wrote down some pages about his life which I think went to a local history museum, though I have a copy which one day I’ll edit for the web. My favourite aunt was ‘Flo’ or ‘Aunt Florry’, one of my father’s five sisters, only two of whom married. She worked in the local registrar’s office, and had actually registered my own birth in her position as temporary interim registrar, but more importantly would take time off from work to take me and my elder brother and sister on days out during our school holidays. Almost always we would go on the tube – a great treat it itself – up to South Ken or Holborn for the museums and we would spend the day there. Museums then were far more serious places than now, with few or any of the special displays that now take pride of place, and very little attempt to be child-friendly, though there were a few exhibits at some with handles you could turn or buttons you could press. But there were the actual things, often in glass cases, with typed labels that sometimes took a lot of reading. My favourite was of course the Science Museum, but others had their fascination. I think then that the museums all charged for entrance, although some may have had free days, but most of their income will have come from the taxes that we paid to the government. Back in those days I don’t think my father earned enough to have to pay income tax, and before we joined the Common Market we had purchase tax, which had different rates but was only levied on ‘luxury’ goods – and so we will have contributed little. Nowadays we all, even the poorest pay VAT on most goods and anyone in full-time work will earn enough to pay income tax. Before the war only around a quarter of families paid income tax, though that fraction increased rapidly in post-war years. And museums have changed dramatically, losing what was essentially their didactic and educational aspect and instead aiming to entertain visitors. Many of the exhibits that used to fill cases are now locked away in back rooms and storage, replaces by colourful display graphics, screens designed to titillate, sounds and more. Of course they are still educational but in a different way, and seemingly made for people with a very limited attention span. And for many museums and galleries now the main attraction is not their permanent collections, fine though these may be, but in expensively mounted special exhibitions, sometimes bringing together artefacts from other collections around the world. These things of course cost money. And more money than the government makes available, so museum often turn to sponsorship. Of course I’ve nothing against companies working together with museums, donating relevant examples of material or equipment, supplying information and expertise. 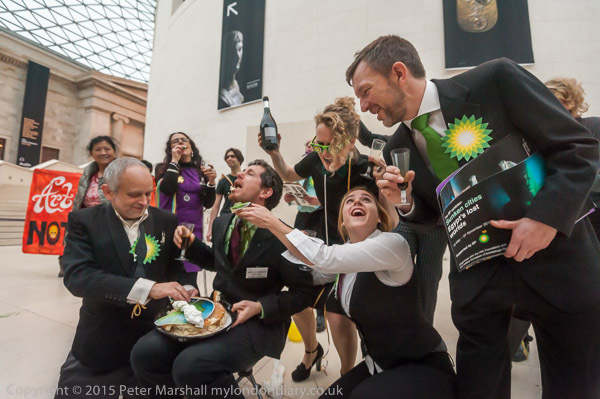 If a museum wants to put on a display about – for example – cane sugar – Tate & Lyle would be an obvious company to assist them, and if they want to put on something about environmental pollution, then BP with their huge experience in the field, including Deepwater Horizon, would have a great deal to offer. 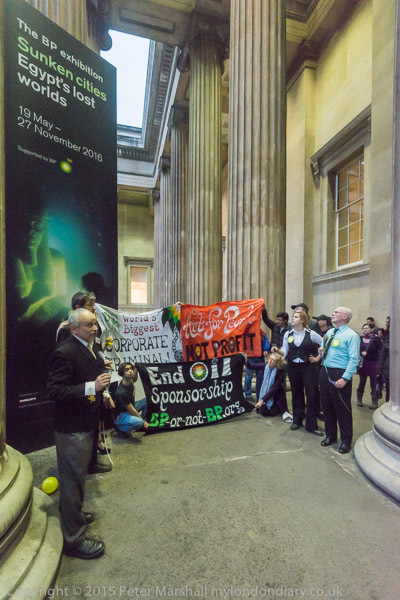 But of course that isn’t what BP’s sponsorship of museums like the British Museum and the arts is about. It’s about hiding the facts about one of the world’s worst polluters behind a facade of promoting the arts and the world heritage their activities are actually helping to destroy through exhibitions such as ‘Indigenous Australia: Enduring Civilisation‘, the ‘Mexican Day of the Dead‘ and ‘Sunken Cities‘. 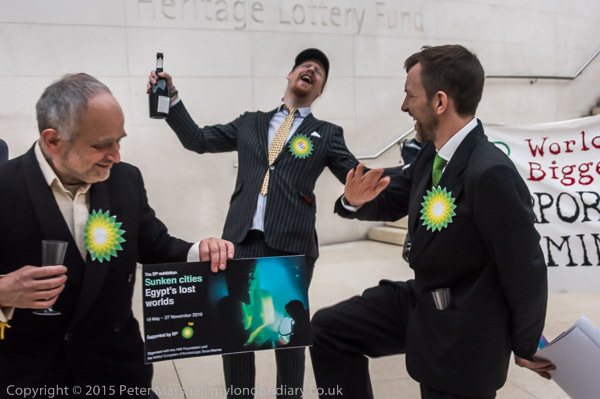 As BP or Not BP put it in their unannounced performance inside the British Museum, thes shows give BP “cheap branding and a social license to operate through all the oil spills“. What the protesters call ‘Greenwashing‘. 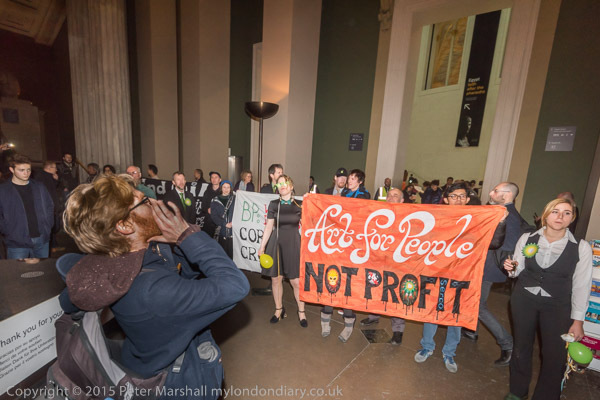 You can read more about the protest performance in http://mylondondiary.co.uk/2015/12/dec.htm#bp End BP’s British Museum Greenwash and of course see my pictures – or some of them – from the event. Unusually I was commissioned by them to photograph the event, which in some ways made it easier and in others a little more stressful. It meant I knew what the performers were going to try and do because I’d watched them rehearse for several hours before the event, but I – and they – had no idea how the museum security staff would react. And on this occasion, like the performers, I had plenty of time beforehand to worry about it. It didn’t quite happen as expected, with a little forgetting of lines and actions, but the performance went remarkably well, and the security who were informed at the start that it would be short and people would leave without any trouble at the end didn’t create any real problems either for the performers or for me and two other freelance photographers who I knew who turned up to take pictures – having, doubtless like the security read the rather sparse details published on Facebook. 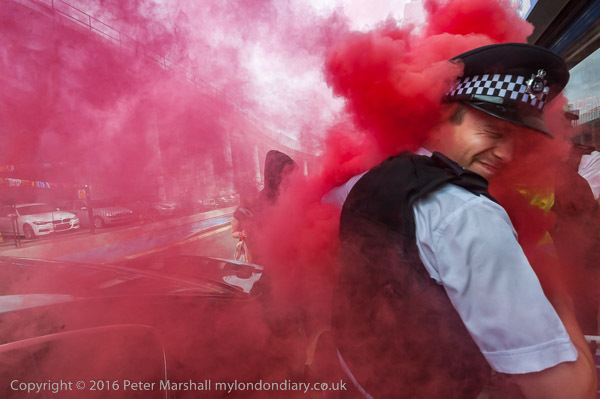 I supplied a set of the best images to the clients for their use, and the images on My London Diary with a couple of exceptions are alternative frames – I took a few more exposures than usual with this in mind. The differences are often rather small – often just a slightly different expression or gesture. As usual I used the D700 with the 16-35mm lens and the D810 in DX mode with the 28-200 (42-300 equiv). Before the performance began I took a few pictures in the Great Hall and decided I could work there without flash at EI 1200, which would give me a shutter speed of 1/125 at an aperture around f4-5.6. The speed was just fast enough to stop most movement and with the wide-angle even working wide open at f4 would give sufficient depth of field for most pictures. Looking back I might have used a higher ISO to give a slightly faster speed, but wanted to avoid extra noise. I’d decided not to use flash during the main performance in the hall, partly so as not to attract too much attention from security. I certainly did not want to be told by museum staff I could not take pictures, though I would have been prepared to try and ignore their requests citing the public interest. When the protesters moved into the darker foyer I need flash, and again when they moved outside to the portico there was relatively little light. I kept on working with flash on the D810, but flash on the D700 is now unpredictable – the camera needs a full overhaul, but given its exposure count I think the expense isn’t sensible – better buy a new camera. And I have one on order now, waiting for when Nikon production gets back to normal. Quite a few of the images taken without flash outside were a little too blurred and I should have should have increased the sensitivity; although the shutter speeds were not particularly slow, I was often rather close to the subjects, where a faster speed is needed to stop movement, and I think the performers were perhaps a little less inhibited. I think we should support museums, but that they should operate without sponsorship from questionable commercial enterprises. 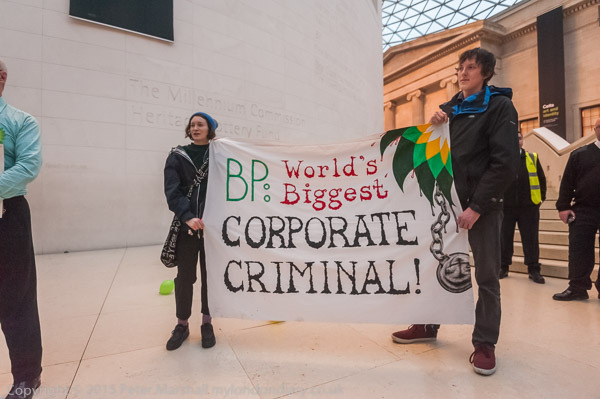 Perhaps protesters might continue the campaign by printing and handing out notes to put in the boxes in the entrances to our splendidly free museums soliciting contributions with a message along the lines “I am not making a contribution as you accept sponsorship from BP, the worlds biggest corporate criminal. If you were not taking their money I would have given you …” and a series of boxes where you could tick to show what you might otherwise have been donated. The amounts from sponsorship are relatively small prepared and might well be replaced by contributions from visitors. Or perhaps museums and galleries should be happy with a lower profile without the special sponsored shows. In the National Gallery which I often visit when I’ve a little time to spare in the centre of London, it’s often difficult to see the pictures for the crowds, especially around popular works. I’m certainly no fan of the expensive block-buster shows which most big galleries seem to put on now, and much more inclined to revisit the works that they keep for me on their walls. I wouldn’t actually want to own Cezanne’s Bathers, Van Gogh’s Sunflowers, Turner’s Fighting Temeraire or most of the other great paintings in the National Gallery (there are a few small works I could fit in if they were going spare), but it’s great to be able to pop in from time to time and look at them on the walls. It seems odd to be thinking of Christmas in July, though I’m sure some of the shops are getting their Xmas displays ready – and certainly ‘Back to School’ displays have already appeared in some although for most children today is the first day of their Summer Holidays. 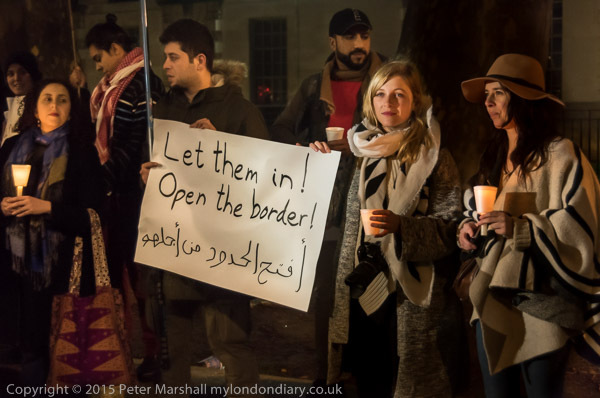 But although this was a Christmas Solidarity Vigil for Refugees, its unfortunately true that little has changed for many of them, still stuck in camps at European borders, including our own small cities of shame at Calais. Its all the more shameful as some of those stuck there are children with relatives in this country they almost certainly have a right to come here and join. But our government (and to be fair the previous coalition and, before that, Labour governments) have an obsession with migrant numbers which prevents them from acting in a humane manner. One of the posters held by the relatively small group of protesters read ‘Canada 25k in one year, Britain 20k in five years. WHY?’ The short answer is that for many years the great majority of our press – owned by a handful of millionaires like Murdoch and the Barclay Brothers – has pursued a racist campaign against immigrants, and forced successive governments and oppositions to outbid each other in shifting to the right. If we think about it, we know that we need immigration and have benefited from it. 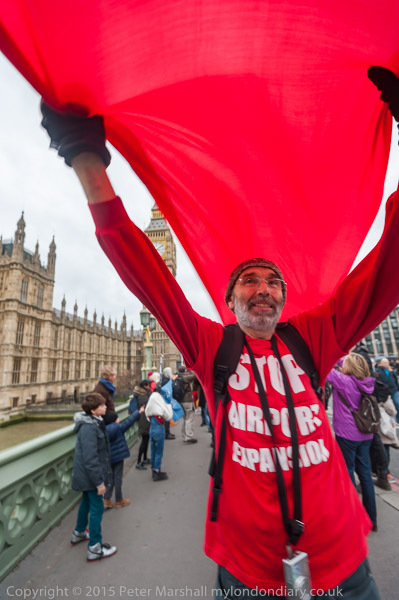 Vital services at all levels would collapse without it, from hospitals down to the many offices and public buildings that rely on migrant cleaners. One of the most stupid and cruel aspects of our treatment of refugees is that so many are locked away in detention centres, as if fleeing from danger and persecution was a crime. Even worse that the real motivation behind imprisonment seems to be to make it harder for those locked away to prove their right to asylum and thus make it more likely they will face forced deportation. And even if they are not locked up, they are denied the right to work, even though many have skills that would benefit society. 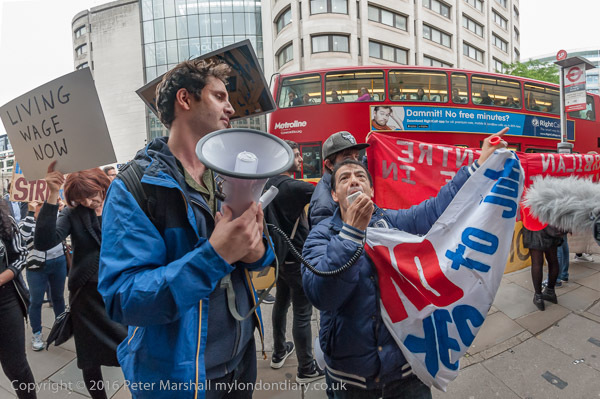 The protest was organised in defence of Syrian refugees and took place opposite Downing St to remind David Cameron of the need to meet his promises and to act as a decent human being. It was quite a gusty night, and it was difficult to light the candles and even harder to keep them alight, though eventually some windshields improvised from plastic cups helped. The street lighting in Whitehall is surprisingly dim, and on the pavement a few yards from the roadway has little effect. For many of the pictures the main light source was the candles, and the protest began around dusk so there was enough ambient to make working at ISO3200 reasonably practicable. As it got darker I cursed that I’d forgotten to bring my hand-held LED light, which, though not very bright, would have made life much easier. In the top picture I grasped the opportunity as a video light from someone else working there lit up just a part of the subject from one side; although video mounted lights generally produce very flat and boring images on video, here the light from well to the left of my camera spilling from where someone was being interviewed was doing a fine job for me. Earlier in the day I’d been at a protest in Stratford, where I number of those present were wearing Santa hats. 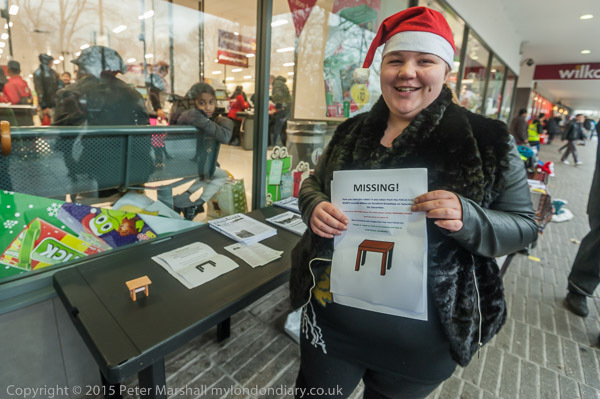 Free the Focus E15 Table came a week after Focus E15’s regular weekly street stall calling for housing for all and an end to social cleansing in Newham had been visited by police and Newham council officials who had ‘arrested’ the table they were using – an action that they later agreed was illegal and led to considerably on-line jollity. The event was celebrated with speeches, songs, posters and a very small table, see here on top of a rather larger one. This week police and council avoided the area. 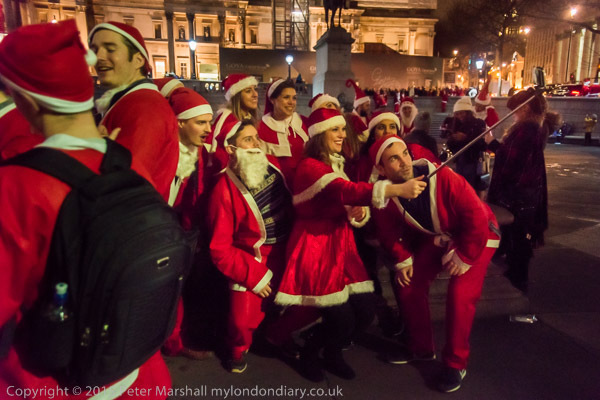 I’d decided not to cover the annual Santacon crawl around London this year, mainly because more important things were happening, but there were still quite a few Santas in Trafalgar Square after I’d finished photographing the refugees, so I stopped for a few minutes to take a few pictures. I’m not against people having a little fun from time to time, and Christmas is a good excuse – why the Christians borrowed Saturnalia for their own festival – to cast a little light into the gloomiest time of the year. And I do rather enjoy seeing a large pack of hundreds or thousands of red-clad figures taking over the streets of London. It would be good to see it encouraged by the authorities and for cars to be banned for Christmas. Other Santas were out having fun for a more serious purpose – and were keen to tell me they had no connection with the drunken frivolity of Santacon. Just as well as they were riding BMX bikes, as this was a BMX club fund-raising charity run. 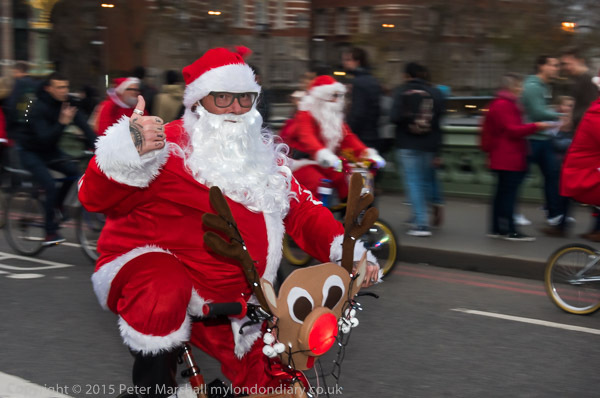 A few more pictures of Santacon and BMZX riders in Santas in London. A little of a shock to my system this morning when I suddenly got a message that one of the external hard drives connected to my system, a pretty full 3.63Tb (that’s 4 TB to the manufacturer) Samsung D3 Station, needed to be formatted to be used by the system. I looked at the drive and tried unplugging the USB3 connector from it and replugging, then rebooted the system, and the drive was still missing. I traced the cable back to the system box, unplugged it and then put it back in, and fortunately that did the trick. Thinking back, it had gone AWOL just after I’d taken a memory card from my card reader close by, and I think I’d perhaps caught my had on the cable from the hard disk and pulled it out slightly, enough to cause the error, but not enough to be noticeable at a glance. Back when I taught a little networking as a part of a Cisco Academy program, the mantra for error solving went ‘cables, cables, cables’ and it has often proved true. One old friend of mine spent 9 months trying to connect a new scanner to his Mac, and I told him I couldn’t help him as I knew nothing about Macs – and it took several Mac repair services before one of them simply tried it with a new cable, and it worked. I’ve been having a problem with a little external power bank I carry around in my camera bag for when my smartphone runs out of juice; small light and very cheap it used to do the trick, but not the last time I needed it. I tried recharging it again and it still didn’t seem to work, so bought another slightly larger model on E-bay – for around twice the cost, at a fiver it was still cheap. I charged it, and tested it and it was working fine. Then I remembered ‘cables’. The new model had a rather nicer looking cable – and when I tested the old power bank using the new cable, guess what? Well, I now have a choice of two usable power banks, and the larger one I’ve just bought will be handy for longer trips. But the hard disk problem made me think and worry. Did I know exactly what was on that Hard drive? And was all of it backed up elsewhere? For this particular drive the answers were mainly positive, though perhaps I do need to think more about where I back up my Lightroom catalogue. Though I do have xmp files saved for all of the images just in case something goes wrong. But I should really spend the time to check that everything is backed up, and not just on my Drobo 5N. If you are an active photographer, then the size of RAW files does make this something of a challenge. The problem for me has really been that storage capacities of cheap media storage haven’t kept up with the increase in RAW file sizes. The RAW files from the Fuji XP2 are around 33Mb, though those from the Nikons are a bit smaller- and with good compression options. Until some time in 2013 I kept every usable image, copying them all to DVD (I’d moved up from CD a few years earlier) but it just became an impossible burden to keep up. The D700 RAW files are around 11Mb (12 bit, lossy compression) a time. Hard drive sizes have increased a little – I recently added an 8TB drive to my Drobo array – and 4GB USB3 drives have become relatively affordable. I’m slowly copying files to one as I write simply for backup – and when it is full I’ll take it off the computer and store it in a plastic bag to keep dust out on the shelf. Maybe give it a spin every now and again to check it is still working should my other copy become unreadable. It isn’t a perfect solution, but nor is anything else. If my house burns down I’ll lose all those images that aren’t stored online. But online storage can’t be relied on either – as some friends have found when companies go out of business. Photography is often largely a matter of solving problems. It isn’t just a matter of pointing a camera, thinking ‘I like that’ and going snap, though occasionally that works, but there are acres of images on Facebook and other online sites that show you the success rate is fairly low. Even where the camera or phone has looked after the technical stuff (and if only more would, but too many people manage to make ordinary scenes as if they were taken in muddy underwater locations) many images simply fail to convey what the person taking them wanted. Of course they may still convey it to them, and obviously do, or they would not have posted them, but too often they fail to communicate to others. But photographs also benefit from an openness, trying to leave room for interpretation rather than determine what viewers think, and also trying to avoid cliche; they need a freshness that stimulates. Viewpoint – angle, distance, angle of view – depth of field, lighting, timing, duration etc are some of the tools we have, and perhaps what distinguishes the truly professional photographer is taking into account the other bits of the picture apart from what they see as the ‘subject’. As I used to tell students, you are responsible for every pixel of our photograph – even those over which you had no control over at the moment of taking. Some of the trickiest problems come when other people create ideas that may sound great, and may even look great, but are impossible, or virtually so, to photograph. 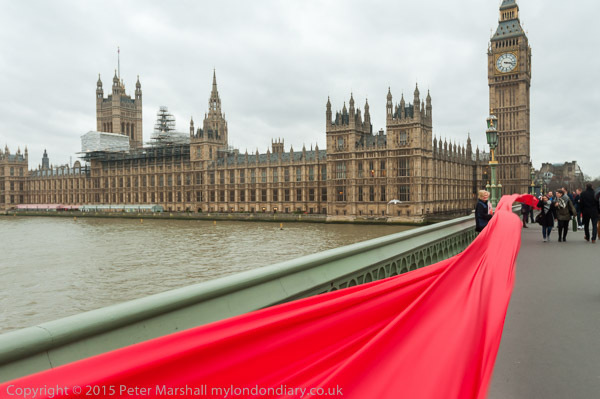 And the thin red line on Westminster Bridge was a good example. 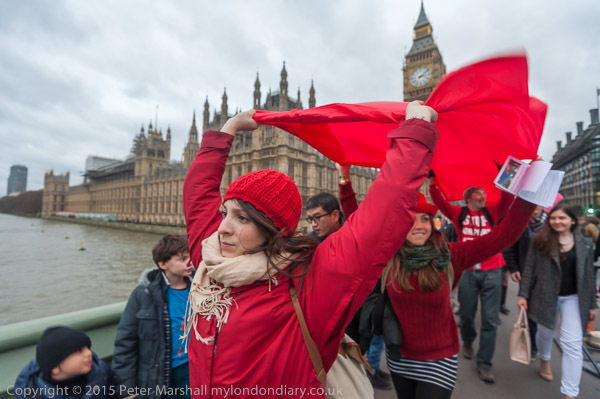 Campaign against Climate Change‘s idea of carrying a red line three hundred metres long across Westminster Bridge as a protest against the inadequacy of the COP21 Paris decisions was a good one, but not the easiest of things to photograph. An object 300m by 1m doesn’t nicely fit the 35mm frame, even if there had been a suitable viewpoint – perhaps hovering far below the legal height in a helicopter mid-Thames – and my budget certainly didn’t run to that. The closest I could have got would have been at the top of the London Eye, and from there I think the line would have been too insignificant. Better in any case to draw it by hand on an image from Google Earth or some bird’s eye source, along with a few little dots for the people holding it. It could have made a long tracking shot on film or video, hoping not too many people got in the way as you dollied along, perhaps with the camera attached to a bicycle. But as always I was making still images. 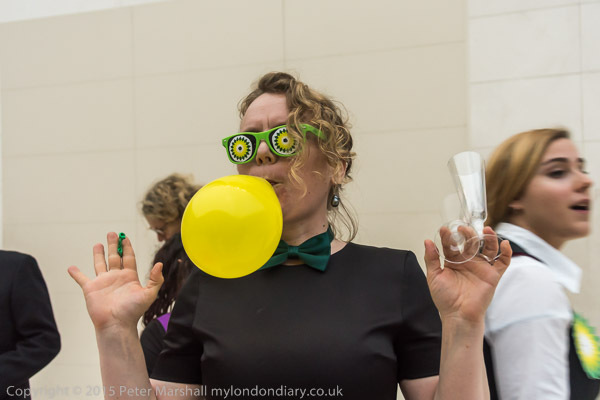 It was too a fairly fast moving event, and with other photographers trying their own way to photograph it – and so far as possible I tried to keep out of their away and to avoid getting them in frame. It was important in at least some frames to show clearly the location – with the Houses of Parliament in the background. 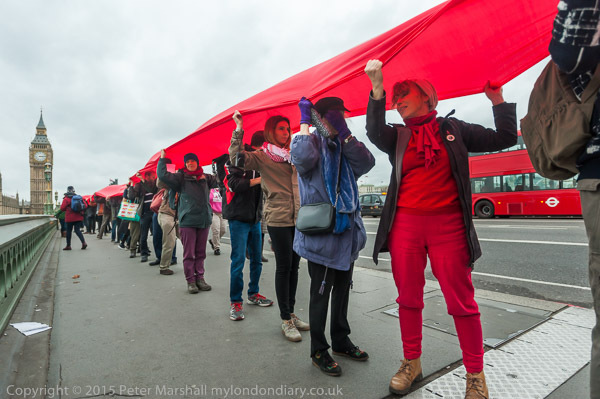 Considering everything I don’t think I did too badly, as you can see from the few frames here and more at Climate Activists Red Line protest on My London Diary. It wasn’t quite in Whitechapel. 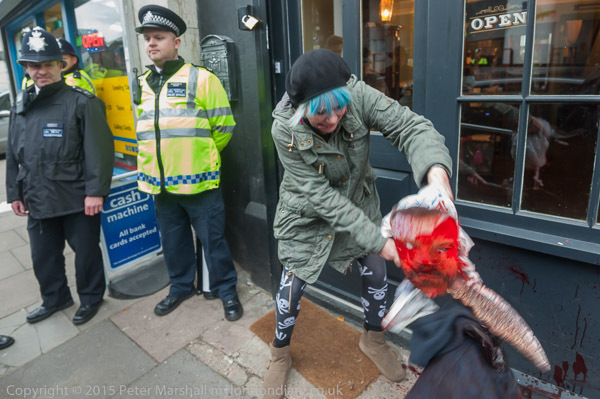 I’m not quite sure what to call the area on Cable St where this violent attack by Jane Nicholl of Class War, witnessed by police, was taking place. A hundred years or so ago it might have been called ‘Wellclose’ or ‘St. George in the East’, but today we’d probably call it Wapping or Shadwell, though historically it lies on the wrong side of The Highway. 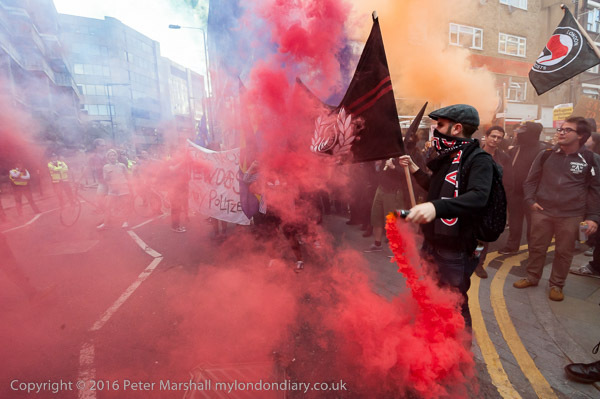 But the bloody massacre was taking place on Cable St, where local communities fought police who were trying to force a way for the fascists to march into the East End, a battle commemorated by a fine mural around 600 yards to the east. 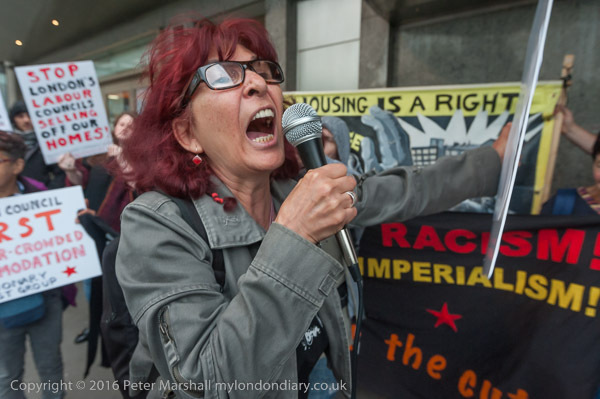 Class War were protesting with others, including fourth-wave feminists, outside London’s tackiest tourist attraction, the Jack the Ripper so-called museum. A whole industry has built up over the years to obfuscate the case, but the police at the time were I think convinced that the vile murderer was Montague Druitt, whose body was fished out of the Thames on December 31, 1888, and no other convincing suspect has emerged, despite the many books and articles devoted to the subject. The murders attracted great attention at the time, largely because of the gory dissection of the victims, but to revel in this so long after is surely pathological. As many have pointed out, there is a great history of working class women in the area, and the Ripper shop got planning permission as a museum to display this, rather than the gory details of an ancient crime against women. 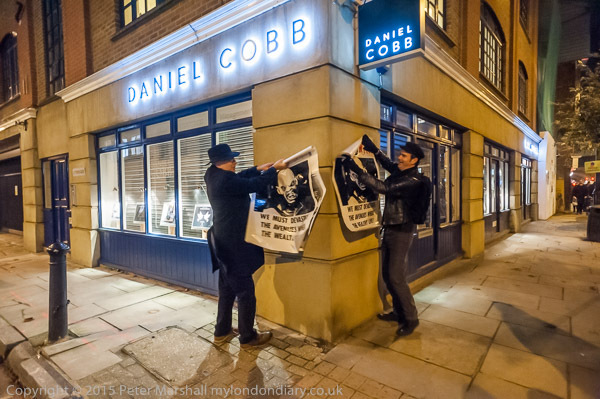 More pictures and text about the Ripper and the event at Bloody Murder at Ripper ‘museum’. Fortunately the ‘blood’ this time was washable. 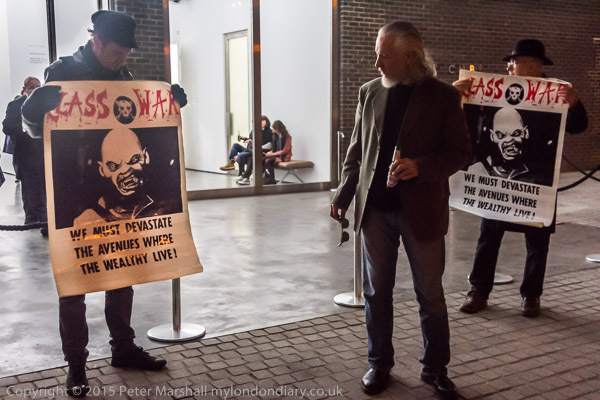 The few nights later I was out again with Class War, though only with a couple of them (I’d expected more), Ian Bone and Simon Elmer, on Bermondsey High St. When I first went to Bermondsey it was a resolutely working-class area, though the industries that had kept the people working had largely disappeared. London’s docks had moved out east to Tilbury, with larger vessels being unable to make it to the Pool of London, and containerisation replacing older and less efficient methods of cargo handling, and changes in technology and globalisation killed off most of the smaller industries of the area. Workshops were now empty, or occupied by artists and the process of gentrification was beginning – and is now almost complete so far as Bermondsey St itself is concerned. One large site is now home to the White Cube Gallery, and there a show was opening by Gilbert & George. I imagine Class War see them as parasites rather than artists (and I’ve never been a fan, regarding their trademark suits as practice rather like the Emperor’s New Clothes, but lacking in much interest – part of an Art World money bubble) and certainly would detest their political views, but here it was their exploitative appropriation of political slogans in the show ‘Banners’ (and I think any actual political banner is really worth more than their feeble images in the show with their childish signature), as well as the whole elitist nature of the gallery that I think was more the target – and made the show a suitable launch pad for a new campaign against gentrification. 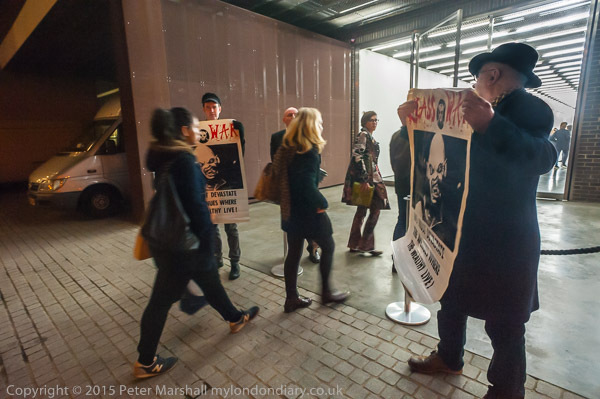 The two protesters stood quietly holding posters on the large yard outside the gallery – an empty paved space worth hundreds of thousands at London property prices, and although it was rather dark I managed to take a few pictures. Their presence of course attracted the attention of the gallery security, who came and talked with them and were told they were a part of the act as it was a show about protest. One security man then went inside to consult the gallery staff, while another stood watching to see the two behaved themselves. A woman came out from the gallery staff and talked with the two protesters, but asked me to stop taking pictures. Since I had already taken enough I didn’t argue, and after some discussion she agreed the protest could continue for a few more minutes so long as the two didn’t interfere with those attending the opening and then left quietly. I sat on the wall and waited to see what would happen – and perhaps was a little surprised that nothing did, and after a short while the two rolled up their posters and walked out. We walked together up the street to another space used for temporary community displays at the rear of a supermarket. There was a little more light, but it was almost all from inside and I had to use flash to avoid making the people and the posters they were putting up silhouettes. But the main technical difficulties were non-photographic; it was a gusty night and Blutak wasn’t strong enough to hold the posters in place on the glass. Finally we walked back up the street, pausing briefly in front of the White Cube, but on the street. Without flash I could photograph the people inside the gallery with the two protesters standing in front, but they were very much underexposed. 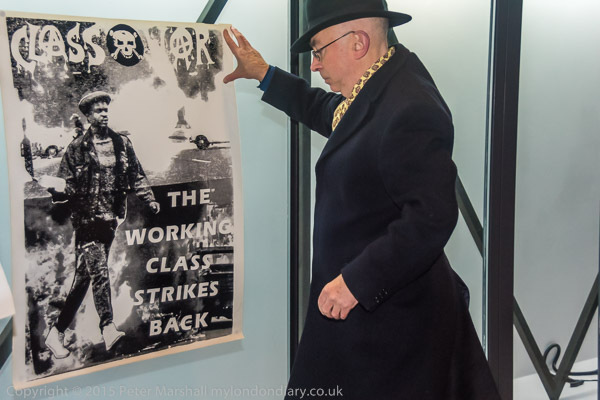 Given enough time I could have added just the right amount of flash, but the two moved on before I’d got it quite right, as you can see in Class War at Gilbert & George ‘Banners’. 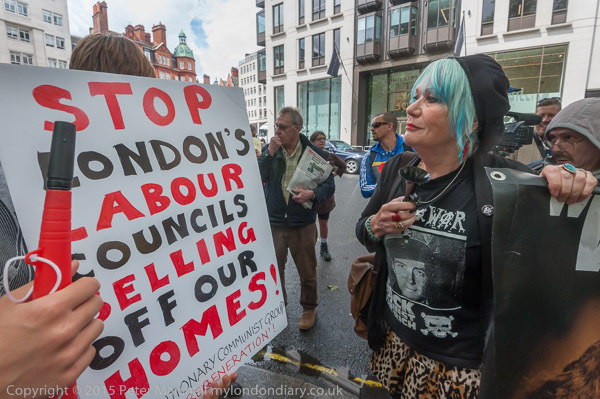 Finally the pair decided to hold up the posters to be photographed in front of several estate agents – who they see as the villains of gentrification, though in reality they merely make excessive profits from it, rather than really driving the process. And as a bonus they found the Fashion and Textile Museum, Zandra Rhodes’ baby. Working with just two protesters made it rather difficult to maintain my normal non-intervention in events, but I was careful not to suggest or tell the pair what to do. If some of the pictures appear posed, it was because they posed, and not because I directed them, though of course I reacted to their actions. And had I not been there they would probably have gone directly home (or more likely to the pub) after their initial protest outside the gallery. Or had they walked along the street perhaps one of them would have been able to photograph the other holding up a poster. 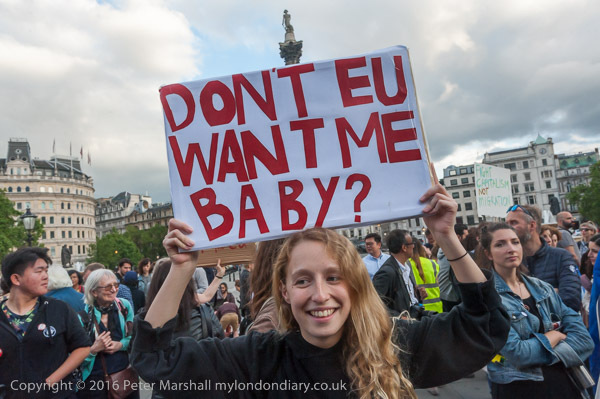 Certainly my presence changed what happened considerably, and much more than is normally the case when I photograph protests. Unless I’ve miscounted there are 34 stories on My London Diary for June, along with a few images taken as I travelled around. I was trying hard to take things a little easier, but events were against me. And events were also against the country. Although I can understand why so many people voted for Brexit, I think the reasons had little to do with the actual merits of the case and that it’s a decision that many will come to regret. Of course we don’t yet have any real idea of its consequences, though I think it almost certain that we will come out of it worse in every respect than if we stayed in. Certainly politically, where Europe has at least acted as a brake on some of the wilder dreams of the right ring fringe which seems likely now to drive our Tory government. I’m not a member of the Labour Party, but it’s sad also to watch its attempts to self-destruct. 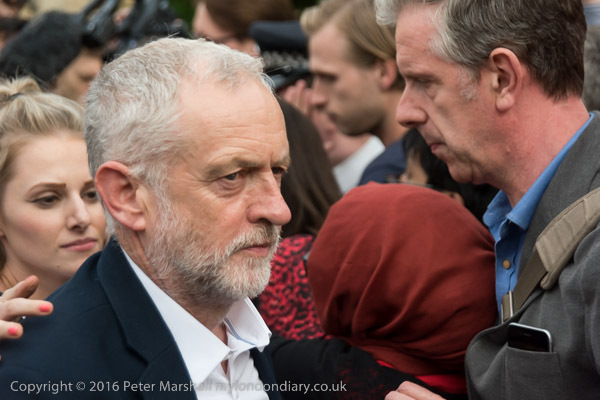 In Jeremy Corbyn they elected a leader who at least had a chance of winning the next election, with many policies that – according to the opinion polls – have a great deal of popular support, but from the start many MPs have been plotting determinedly to sabotage his leadership. He seems so far to have done pretty well despite this, perhaps why the establishment is so much against him, and determined to do him down. I’ve been listening to his speeches and photographing him for over 20 years and while I don’t always agree with him, I think he would make one of the better prime ministers we’ve had. Things are I think changing in politics, and much of the old left/right stuff is now irrelevant, just a silly political game which the media love for its simplicity. Rip Down the Ripper Facade! Like many who came to photography in the last century, I learnt to make fine black and white prints from Ansel Adams. Not in person, but from his ‘Basic Photo Series’, in my case the ‘New Edition’ published in 1968, a series of five slim but information-packed volumes of which I bought two, Volumes 3 and 4, The Print and Natural Light Photography. Somewhat surprisingly I’d come across the first two volumes (Camera & Lens and The Negative) in my local library, where they comprised almost the whole of the photography section, or I might have saved up for at least the second of these, and I bought both in the early 1980s when they came out in a rather less pithy form in ‘The New Ansel Adams Photography Series’. I was never a huge fan of Ansel’s photography, and never more than dabbled in large format photography – I can count the number of exposures I made personally on 10×8 on the fingers of one hand (and wouldn’t show them even to you), though I acted as an unpaid assistant for rather more. I still own two 4×5 cameras, though they’ve long been gathering dust, a monorail I think only ever used for copy work and similar, and an MPP folder that I perhaps made a few hundred exposures with, particularly when I had an interest in alternative processes that require contact printing. But I’d been very impressed by the quality of Ansel’s prints when I saw them exhibited in London, something at a quite different level to the work at other exhibitions I’d seen here in the UK, both in the tonalities and presentation. When I joined a camera club and decided to put work into their monthly competitions, I printed following his precepts and also presented my work following him as guide, working with large white (or slightly off-white) archival board window mounts. It was probably this departure from the then accepted norms rather than my different subject and approach that caused more derision from many established club members and some club judges, though it also gained me some friends and a few others who began to follow my lead. I certainly would not make a video of my darkroom, cramped and lacking in facilities, though a good example of how much you can pack into a very limited space, but you can see Ansel Adams’ darkroom – and some brief glimpses of the man himself at work on line at PDN Pulse. Of course it’s nowadays a historic record – rather like an exhibit at the Science Museum – than of any practical use. Some photographers continue to use film, and if you are happily doing so, then that’s fine. But those who are evangelistic about it are I think in the main deluded – there really are no good reasons for doing so. Technically digital wins in every way, and even if you want the kind of incorrect colour rendition we had to put up with on film, or the excessive grain when pushed in low light, or any of the other defects that some film aficionados seem to prize, you can more easily produce them on digital files. Of course digital isn’t limited to this, it can also do much that film never could. While I’m sure that were Ansel still around and still sprightly despite being 114 he would still be in that incredible darkroom, I’m also sure he would be relishing the possibilities of digital imaging and particularly digital printing and of software such as Photoshop that would give him even greater control over his images than he ever managed in the darkroom. I’m still making use of what I learnt from him in front of the computer, even though my darkroom has long been gathering dust. No, the heading isn’t a description of my own My London Diary, though I have to admit that I have often posted too many pictures of a particular event, but part of the headline of an article I read on PetaPixel, Rant: Street Photographers are Posting Too Many Terrible Photos Online. Is it outstandingly beautiful in the way it contrasts light/shadow, or the way the lines, silhouettes, and shapes come together? Is there some clever juxtaposition? Will the viewer be hit by a tornado of emotions? Will it make people laugh, blush, or cry? Of course it’s sometimes nice to make pictures that use some of these things, though I’m rather doubtful about that “tornado of emotions”; I’d prefer to have photographs that make people think and that are more open to different interpretations. And that have perhaps a certain mystery. But above all photographs that are not just about making pictures, but that have something to say about the society we live in. And of course much that has been called ‘street photography’ does. One of the books on the shelves next to my computer desk is perhaps the bible of street photography, ‘Bystander’, by Colin Westerbeck and Joel Meyerowitz. It’s a work that everyone who wants to think of themself as being a ‘street photographer’ should read and digest, full of great work by photographers I admire, including Walker Evans, Helen Levitt, Garry Winogrand and more, although one of the photographers dealt with at greatest length in the book, Robert Frank, refused to let his pictures appear, so they should read it together with his ‘The Americans‘, a book I think you can’t really call yourself a photographer unless you own a well-thumbed copy of. I think I’ve more or less got over being a street photographer, though I work most of the time on the street, if anything I do think of myself as a ‘post-street’ photographer. Been there, done that, eventually got bored. Rather than repeat myself, I’ll leave you to read what I wrote then. I’ve mentioned before l’Oeil de la photographie, or as I should probably call it now that it seems to have fully sorted out its English version The Eye of Photography, and for those of us not in Arles, its perhaps one of the best ways to follow the festival. I’m not sure I believe it, those dinosaurs have a remarkable resilience, but then I’m sitting a long way away, living through ‘interesting times’ in London. Given our Brexit vote, perhaps I should give it all up and move to the south of France while I still can and hope I’ll be allowed to stay after our break becomes final. Lower down the page on ‘l’Oeil‘ (I’m afraid the English short-form ‘Eye‘ is long taken by a magazine of a rather different nature, where you can often read the truth behind British politics that the establishment would prefer was kept private but lacks much appreciation of photography) you can follow links to some of the exhibitions and events you are missing. I’m not worried about missing Don McCullin‘s show as I doubt it has anything to add to what I’m already familiar with, powerful though some of his images are, but there are other shows that I’d love to be able to stroll into, and I’ve just wasted some minutes on walking around the city on Google Streetview – which makes me wish I was there rather than in front of my computer on a dull morning on the edge of London. Perhaps a little later I’ll sit in the garden and treat myself to a glass of wine, close my eyes and dream. But then I’ll have to wake up, rejoin the real world and pick up my camera bag to cover a rally opposite Downing St against the continuing siege of Gaza and an end to the UK’s arms trade with Israel. You are currently browsing the Re-photo blog archives for July, 2016.